The fate of reform measures hangs on ballot language written by the state attorney general, usually a Democrat elected with strong union support. More than 20 times in the last 15 years, political leaders looking to control California’s fast-growing public pension costs have tried to put reform initiatives before the voters. None of the proposals has made it onto the ballot. Often, advocates could not raise enough money for signature gathering, advertising and other costs of an initiative campaign. Some of the most promising efforts, however, ran into a different kind of obstacle: an official summary, written by the state attorney general, that described the initiative in terms likely to alienate voters. Facing bleak prospects at the polls, the sponsors abandoned the campaigns. Taxpayer advocates contend that the attorneys general — Democrats elected with robust support from organized labor — put a finger on the scale, distilling the initiatives in language that echoed labor’s rhetoric. Labor leaders say the summaries were neutral and accurate, and that the problem lay with the initiatives — which, they contend, would have diluted benefits already promised to public employees. The attorney general’s title and summary, which appear on petitions and in the official voter guide, can powerfully shape attitudes toward a ballot measure. The language has emerged as a battleground between those seeking to overhaul California’s public retirement system and those determined to defend it. Retirement benefits are the fastest-growing expense in many municipal budgets. In Los Angeles and other cities, they account for 20% or more of general fund spending. The burden has pushed some cities to the edge of bankruptcy. Yet a string of court rulings, known collectively as “the California Rule,” has posed a formidable barrier to change. 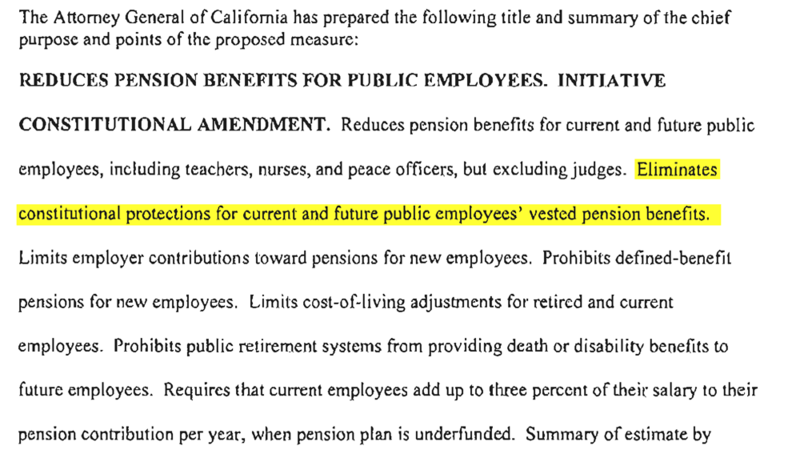 It prohibits cuts in pension benefits already granted or promised. Under the rule, pensions are considered binding contracts protected by the state Constitution. For that reason, many of the cost-saving measures passed by the Legislature in recent years, including later retirement ages and smaller monthly pension checks, did not affect employees already on the payroll. They applied only to newly hired workers. As a result, the savings will not kick in for many years. Pension reform advocates say that achieving real relief in the near term will require reductions in benefits already granted to current employees. Because of the California Rule, that can be done only by amending the Constitution. And that requires a ballot initiative. A wide majority of California voters surveyed have favored changing the pension system to save money. Support drops sharply when the change is framed as reducing benefits for teachers, police and firefighters. Disputes over the language have figured prominently in several major reform attempts. The most recent, in 2013-14, was led by then-San Jose Mayor Chuck Reed and former San Diego City Councilman Carl DeMaio. Reed, a Democrat, and DeMaio, a Republican, proposed a constitutional amendment to alter the California Rule by targeting future benefits of current employees. Workers would keep retirement benefits they had earned, but future benefits would no longer be guaranteed; they would be determined through collective bargaining or public referendum. The word “eliminate” “fosters a visceral negative response from voters,” according to a memo by the labor coalition’s Washington pollsters. The Sacramento Bee published an article about the memo in December 2013. Three weeks later, then-Atty. Gen. Kamala Harris issued her summary of the initiative. Consultants for a labor coalition advised emphasizing to voters that the Reed-DeMaio initiative would “eliminate” pension benefits and break promises to workers. Reed and DeMaio cried foul when then-Atty. Gen. Kamala Harris’ official summary of their initiative echoed some of the points highlighted by the labor consultants. The court sided with Harris, ruling that Reed and DeMaio had not proved the summary was false or misleading and that the attorney general is afforded “considerable latitude” in crafting the language. Reed and DeMaio dropped the initiative in March 2014 after concluding that it was unlikely to win with Harris’ ballot language. “I personally didn’t think she would be so obviously, egregiously negative,” said Reed, now special counsel at Hopkins & Carley, a Silicon Valley law firm. Harris had been elected attorney general in 2010 with strong financial support from labor: more than $600,000 in donations to her campaign and to independent expenditure committees, according to the National Institute on Money in State Politics. She raised a total of $7.5 million that year. Harris received an additional $400,000 from labor for her 2014 reelection effort, and she collected $73,102 from public employee unions in her successful $14-million campaign for the U.S. Senate last year. Harris did not respond to requests to be interviewed for this article. Maviglio said recent pension initiatives have simply been too extreme for voters to support. “I think that’s just a lame excuse for their political malpractice,” he said. A former senior advisor to Harris said the attorney general was keenly aware of how the title and summary could affect a ballot measure’s prospects. Staff attorneys typically drafted multiple versions after consulting both advocates for and opponents of a particular initiative, the former advisor said. Staff lawyers would weigh the pros and cons of each, and Harris would approve the final wording. Regarding the Reed-DeMaio initiative, the former advisor said the similarity between the attorney general’s summary and the labor memo reflected shared values, not a quid pro quo. It was the second time Harris approved summary language that proponents of pension reform regarded as unfair. 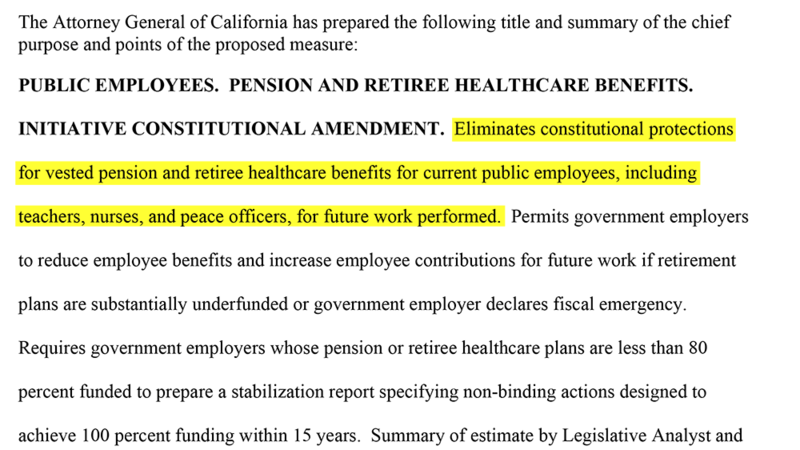 California Pension Reform, a Republican-led advocacy group, proposed an initiative for the 2012 ballot that would have reduced benefits for both current and newly hired public workers. It called for imposing caps on how much government employers could contribute toward workers’ retirements. 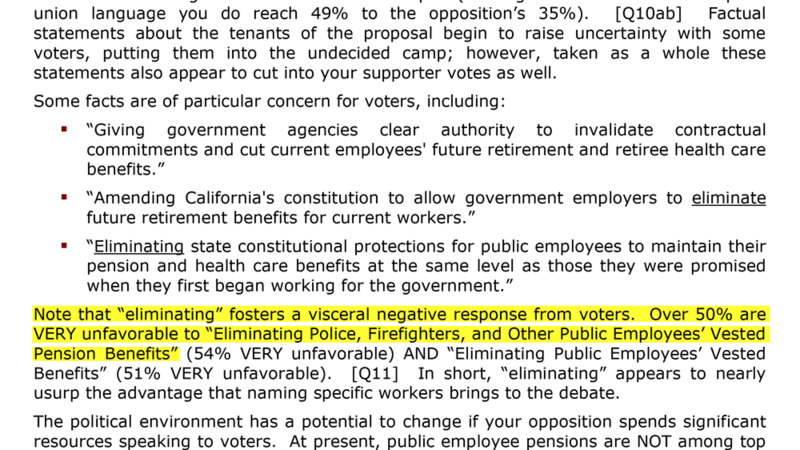 Harris’ summary of a 2012 initiative infuriated Californians for Pension Reform, which called it “false and misleading.” The group dropped its initiative campaign. Dan Pellissier, president of the advocacy group and a former aide to Assembly Republicans, said there wasn’t enough time to challenge the attorney general in court and still collect enough signatures to meet the ballot deadline. He said the summary was unfair because it stated as fact that pension benefits are constitutionally protected when the issue is in dispute. Become a Los Angeles Times subscriber today to support collaborations like this one. Start getting full access to our signature journalism for just 99 cents for the first four weeks. One of Harris’ predecessors, Democratic Atty. Gen. Bill Lockyer, was accused of writing politically charged language for a pension measure in 2005. The initiative, proposed by then-Gov. Arnold Schwarzenegger, would have given future state workers 401(k)-style retirement accounts instead of traditional pensions. But the Republican governor abandoned the initiative in April 2005, after Lockyer’s office issued a title and summary that said the measure would eliminate death and disability benefits for future public employees. Schwarzenegger’s initiative did not mention death benefits. But the governor’s advisors appeared to have overlooked a key detail: death and disability benefits were tied to guaranteed pensions. Newly hired civil servants, who wouldn’t have such pensions, wouldn’t have the associated benefits either, unless they were provided separately. Opponents of the measure seized on the issue and mobilized widows of slain police officers to speak out against Schwarzenegger’s proposal. Schwarzenegger said at the time that he would never eliminate police death benefits, and that Lockyer had misinterpreted the initiative. Then-Gov. Arnold Schwarzenegger explains the failure of his 2005 pension reform initiative. The governor’s communications director, Rob Stutzman, suggested that the attorney general was trying to curry favor with labor unions to mount a possible bid for governor. Lockyer received more than $1.5 million in campaign contributions from public employee unions during his two terms as attorney general. Lockyer, now a lawyer with the firm Brown Rudnick in Orange County, said his staff’s analysis of the Schwarzenegger initiative was correct. “They complained about it, but it was a lot of political whining,” he said. Jon Coupal, president of the Howard Jarvis Taxpayers Assn. which backed Schwarzenegger’s proposal, disagreed. He said nothing in the initiative would have prevented death and disability benefits from continuing. “They created ambiguity out of whole cloth,” he said. Reed and other proponents of pension reform plan to put a new measure on the ballot next year. If they do, the title and summary will be written by California’s new attorney general, former U.S. Rep. Xavier Becerra, a Democrat from Los Angeles. Then-Rep. Xavier Becerra at a hearing on his nomination as attorney general. Becerra discusses his philosophy on public pensions at a Jan. 24 news conference, his first as attorney general. Becerra was nominated to serve the remainder of Harris’ term after she was sworn in as a U.S. senator in January. During his confirmation hearing, Becerra was asked about the attorney general’s obligation to write neutral summaries for ballot measures. After his confirmation, during his first news conference as attorney general, Becerra addressed the issue again. He said he recognized the need for “fiscally sound” pension policies, but added that his father was a retired union construction worker, with a pension. Judy Lin is a reporter at CALmatters, a nonprofit journalism venture in Sacramento.